Already the relatively dry April and start to May has seen bowling greens suffering from Localised Dry Patch (LDP). 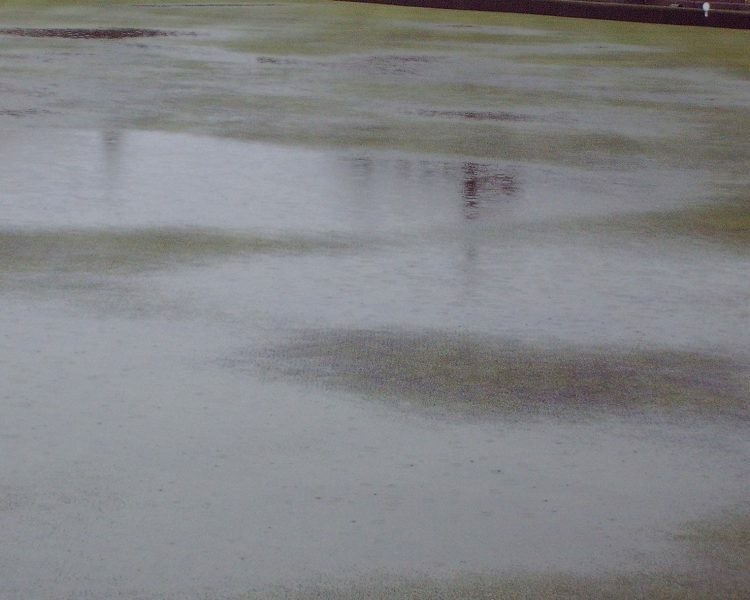 As we have discussed many times on this site before, this condition is a major problem for bowling clubs throughout the UK and if your bowling green is aready showing the tell tale signs then you need to take rapid and relentless action to avoid major disruption to your bowling green surface this season. The key objective at the moment is to concentrate on getting the soil in the affected areas to re-wet or at least become less hydrophobic. Immediately mini-tine the affected rinks to create some linkage through the thatch layer to the under lying rootzone. After mini tining you should apply a granular wetting agent and make sure this gets well into the holes; water the green as required. In addition to the granular wetting agent and regular irrigation practices you should purchase a hand held wetting agent applicator that fits on to the end of a hose. These accept wetting agent tablets or pellets and you should hand water the affected areas until flooded using this device on a daily basis, even during rainy periods. Sarrell roll the green at least once per week (or at least the affected areas); Sarrell rollers create thousands of shallow holes over the green surface and allow the water to penetrate the soil surface more readily. Take core samples from the affected areas at regular intervals to gauge the amount of re-wetting that is taking place. This should help you to get on to the most pressing work, but please keep checking back here for updates. Why is Thatch the single biggest problem in Bowls Green Maintenance? Do you think that mixing liquid wetting agents with liquid fertiliser is a good idea? You should always check compatibility with the product manufacturers before proceeding with any tank mix, but generally there should be no problem using wetting agents and fertilisers in liquid form. What’s different about liquid form and granular form of wetting agents? The answer to this one is easy, when there is active growth to allow fast recovery. You won’t see a start to that until the soil temperature reaches a steady 5 degrees C and even then it’s usually a slow start. Remember this is soil temp and not air temp. I usually don’t recommend hollow tining in the spring in this part of the world. Spring is too late coming here and it’s usually well into the bowling season before growth is sufficient. It’s also heavily reliant on sufficient moisture afterwards, and there is a tendency towards dry weather in April which can cause this to backfire big style. Pencil tining, followed by wetting agent if you have dry patch and the green iron, sounds like a good plan to me. You could follow this up with scarification later (once growth is vigorous) without causing too much disruption. Thanks for your quick reply,I shall do my best to follow your comments .I’ll have a selling job to do to the management and the contractor neither of which like being told what to do.